On 8 August 2009, it is one year since the Colombian police detained our comrade and friend Liliany Obando and charged her with two counts of rebellion and managing funds for a terrorist organization. Liliany Obando was a representative of the Agricultural Workers Union Federation (FENSUAGRO). Liliany is charged with rebellion. This is a common catch-all charge that is regularly used to imprison those who speak out against the government for long periods without trial. 'Rebellion' also allows the regime to smear those accused of it as being 'terrorists' and helps to delegitimise their work. Colombia has the highest rate of killings of union activists in the world. We ask all unionists to demand that the Colombian government free Liliany Obando. The Colombian Attorney General’s office. Ssangyong workers are on strike. They have occupied the factory at Pyeongtaek in protest against mass sackings. Monday 27 July - China Hong Kong: HKCTU calls a protest action against Korean government suppression on Ssangyong Motors workers strike. The company and government have used serious violence against the workers, blockading the site and stopping food and water deliveries. The police even arrested doctors who are trying to provide medical assistance to injured workers. Marching to the Premier’s Office, Spring Street. They are fighting to improve their conditions. They are fighting to save the ambulance service. The problems: long delays in emergencies, dangerous paramedic fatigue and intensive care MICA service in meltdown. Victorian ambos are campaigning for a better, safer ambulance service for you and your community. The union has surveyed nearly 20 percent of Victorian ambos and found that 75% have made mistakes because of extreme fatigue. They’re averaging just 6 hours sleep each night and often less than that. We must fix this, or even more experienced ambos will leave the job. That will mean waiting even longer in emergencies. We want Ambulance Victoria to provide a first class service to all Victorians. That’s why we urgently need to resolve our enterprise bargaining negotiations. A key demand is for 10 hour rest-breaks between shifts. That will allow us to rest properly between shifts, which are often more than 14 hours long. Five AMIEU members at an abattoir at Narrikup, Western Australia, were allegedly made “redundant”. These members were very active within the Union leadership group and have been vocal about legitimate grievances about wages and conditions at Fletcher International. Fletchers International have been sanctioned by the Department of Immigration and Citizenship for breaches of their obligations as sponsors of 457 visa workers. The Meat Workers Union and its members are being systematically targeted by Fletchers. These workers and their families in the Philippines have no current income, can access no welfare or unemployment benefits and do not have access to Medicare health benefits. The current conditions on their visas do not permit them to work elsewhere. For growing numbers of Nestlé workers around the world, it's "Good Food - Good Life - Goodbye to Union Rights in the Workplace". 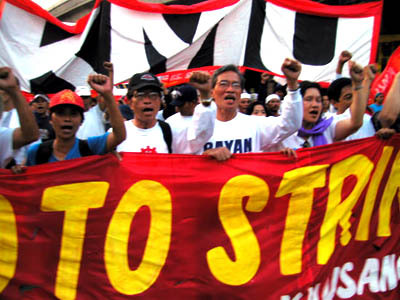 The IUF and its affiliates are currently fighting against major violations of basic rights at Nestlé in Indonesia, India, Korea and Hong Kong. Support our Struggle! Stop Nespressure! For the past two years at Nestlé INDONESIA, the union has been requesting negotiations for badly needed changes to the collective agreement. Management has responded by creating a fake union and pressuring workers to join it. Emergency Services Officers at Morwell's Hazelwood power station have been striking for almost 4 months, demanding better pay and conditions on par with their follow workers at Yallourn and Loy Yang power plants, increased numbers and proper safety training. Emergency Services Officers take on responsibilities in situations of fires, leakages, equipment failures and all other safety risks in the mine and the power plant. Yet their base rate of pay is just $19.32 per hour, only slightly above minimum wage. This is a solidarity meeting to hear reports about the situation in the Philippines, discuss proposals and build our campaigns in support of workers' rights. Hiroshima Day Rally on Saturday 8 August, 1pm State Library, Swanston Street, Melbourne, Australia. Steven Starr, a visiting scientist from the US will be joined by Dave Sweeney of the ACF and Felicity Hill from WILPF on the speakers' platform. OHS Laws - Not Good Enough!